I can still remember the days when I first played Rockman. It was Rockman 3 and I was a 9-year-old kid back then. The games would always end up in frustration because I just can't get past stages no matter how hard I tried. I still remember the easiest boss, which was Snakeman, who shoots snakes onto the ground. Hilarious. 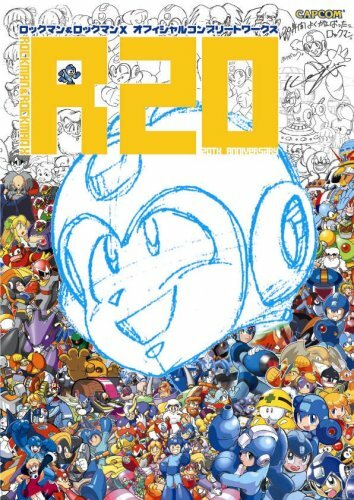 R20 is the art book to celebrate the 20th anniversary of the classic game, which has also spun off to create Rockman X. This is a thick 336-page paperback with a matte dust jacket. The pages are low gloss, my favourite type. This is an amazing tribute. It includes all the Rockman and Rockman X series released for the different platforms. That's all the games from 1987 to 2006. There are character designs included for all the characters, from the bosses down to the last hard-hat helmet bot that walks the ground. All these are full colour manga-styled illustrations occupy close to 200 pages. After that, there are more character sketches and concepts, promotional art, game covers and a few splash pages. This book packs so much art that there's almost no breathing space. Just look at the cover art and you'll get the idea. This is a very busy universe. Everything in the book is labeled in Japanese. Unfortunately I can't read captions for there are a lot which seems like artists' notes. Good news is, Capcom will be translating the book to English and releasing them as two separate books, Mega Man: Official Complete Works and Mega Man X: Official Complete Works. This book is highly recommended to Rockman fans, video game and character designers. Missed out on the Mega Man games when I was younger, no idea why, and I love 2d platformers/shooters to boot :(.